The LSM offers outstanding young researchers an innovative and high quality German doctoral degree in life sciences, entirely taught in English. The programme combines both supporting course work and as well as individual research. Students benefit from the quality of research and teaching at the Faculty of Biology and the Faculty of Chemistry, Biochemistry and Pharmacy of the Ludwig-Maximilians-Universität München, while living in the attractive city of Munich. The members are integrated into a stimulating research environment composed of excellent faculties and a large network of institutions and facilities. The HighTechCampus LMU in Grosshadern-Martinsried is synonymous with well-connected and internationally renowned research in life sciences at the LMU Munich. 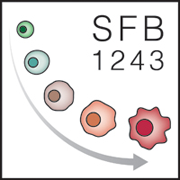 This one-of-a-kind cluster supports research on the highest level, often in direct collaboration with the adjacent Max-Planck Institutes for Biochemistry and Neurobiology, and with the German Research Center for Environmental Health (Helmholtz Zentrum München). The special characteristic and incentive of the Graduate School Life Science Munich - From Molecules to Systems - lies in its transdisciplinarity and intersectoral broadness. Provided by combining training elements from natural science, public/private entrepreneurship, ethics, responsibility in science and public outreach. This in itself leads to enormous potential in conceptual thinking, research design and technology platforms. 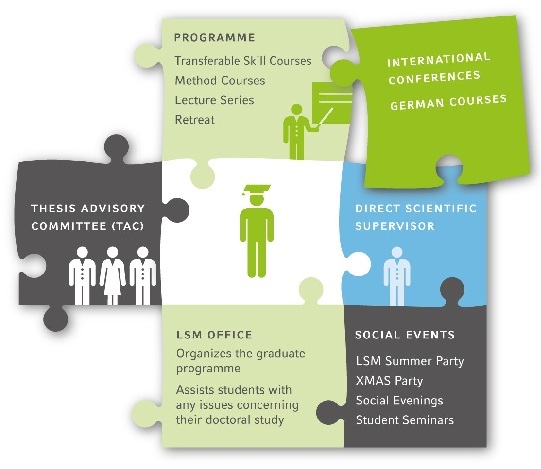 The LSM programme is highly multidisciplinary, as it represents the entire spectrum of research and teaching carried out in the Faculty of Biology plus aspects in pharmaceutical sciences and chemistry. For information about research and teaching at the LSM please choose the corresponding sections of our website.